Margaret Louise Kosh Norcross was born on March 9, 1931, near Bryan, Texas. 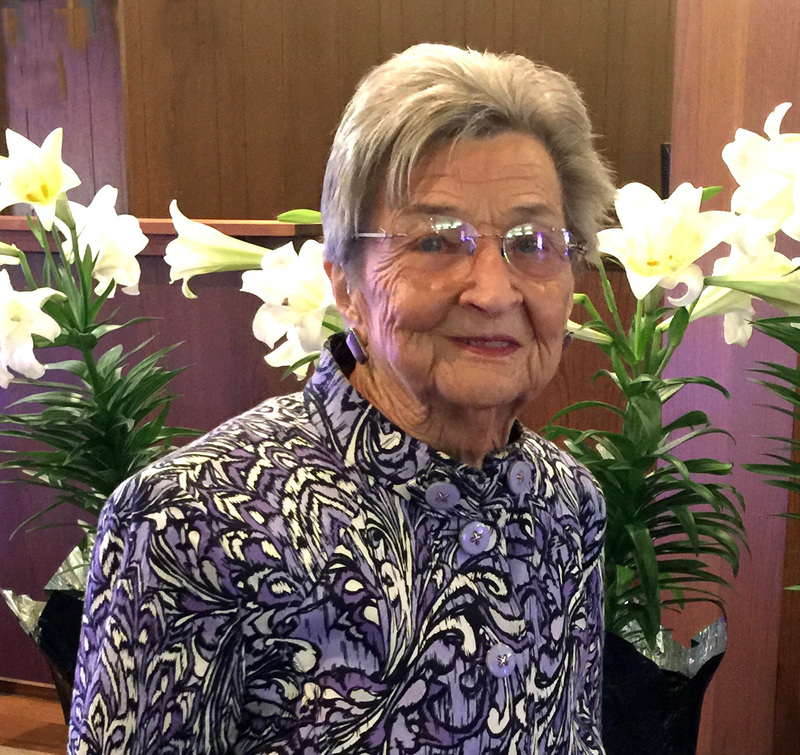 After 87 wonderful and fulfilling years, she passed away on November 4, 2018, in the comfort of her home in Wolfe City, Texas. Margaret graduated from Stephen F. Austin High School and after graduation worked as a sales clerk at the iconic F. W. Woolworth five-and-dime store in Bryan. She met her beloved husband, Allen Norcross, on a blind date. They fell in love and were married on August 4, 1951. During their 49 years of marriage, she was a devoted wife to him and a devoted mother to their six children. Margaret was always willing to pack-up and move to wherever Allen’s career path led, which included cities throughout Texas, Oklahoma, and Louisiana. Margaret, herself, found gainful employment opportunities that ironically included being with her children and husband. In Plano, she was a cafeteria cook when son Mark was in elementary school; in Lancaster, she was the photo booth manager where daughter Karla worked after school; and in Dallas, she was the parking garage attendant at Thanksgiving Tower where Allen was the building security manager. In 1993, they chose Wolfe City, Texas, as their final retirement destination. During their years together in Wolfe City they enjoyed spending days outdoors clearing property, working cattle, gardening vegetables, and hosting family reunions. After Allen’s passing in 2001, Margaret found comfort and support from several groups of friends in Wolfe City. She was a member of the First United Methodist Church, the Eastern Star, the Red Hats, and the Skip-Bo Card Group. Her hobbies included flower gardening, vegetable gardening, sewing, and cooking. Margaret’s front-yard flower garden will always be remembered as the favorite family photo background, as well as a favorite landing site for hummingbirds, bees, and butterflies. Produce from Margaret’s vegetable garden was always shared with neighbors, friends, and family. Margaret’s gift of sewing can be seen in many family photos especially when it came to coordinating outfits for twins Karl and Karla. But, of all these hobbies, the grandchildren best remember “Grandma Maggie” in the kitchen baking cookies and cakes, boiling macaroni, frying potatoes, and roasting turkeys. Margaret had a passion for birds. She would love to watch birds while sitting on the porch, or in more recent times, while sitting in her recliner by the window. Her favorite song was Snowbird, by Anne Murray, and her favorite Christmas decoration was the Red Cardinal. Her family loved to spend time with her and take her on outings and trips. Her relatives loved her hospitality. Her friends loved her presence at parties and card games. Margaret was loved by many and will be missed by many, but the sorrow is overcome knowing that she is in God’s Heaven. Margaret Norcross is survived by five children: son Fred Norcross and wife Alicia of Wolfe City; daughter Paula Fitzgerald and husband Larry of Wolfe City; son Roy Norcross and wife Sandra of Colorado Springs; daughter Karla Walker of Bonham; and son Mark Norcross and wife Audrey of Ogden. She is survived by grandchildren Eric, Shelley, Brandon, Lauren, Brent, Blake, Katy, Nick, Wesley, Becca, Kelsey, and Alyssa. She is survived by great-grandchildren Hylee, Emma, Alec, Megan, Lili, Alec, Sophia, Ellen, Ian, Daisha, Philomena, Phoenix, Avery, Marley, Odin, Rally, Axl, Paityn, and Maddyn. She is survived by great-great-grandchildren Zaya and Kayden. Margaret Norcross is also survived by two sister-in-laws, two brothers, and two brother-in-laws: Eddie Kosh and wife Cathrine of Moulton; Henry Kosh of Bryan; David Hutcherson of Corpus Christi; and Douglas Norcross and wife Sara of Frisco. And, she is survived by numerous loving nieces and nephews. Margaret Norcross is preceded in death by her husband Allen Belcher Norcross and by her son Karl Ray Norcross. She is preceded in death by her mother Victoria Mary Dziedzic Kosh, her father Adam Albert Kosh, her mother-in-law Hallie V. Belcher Norcross, and her father-in-law John Wilfred Norcross. She is also preceded in death by four sisters, four sister-in-laws, one brother, and five brother-in-laws: Pauline Holubec and husband Jim; Helen Bean and husband Clarence; Agnes Young and husband Johnny; Ann Hutcherson; Freddie Kosh and wife Evelyn; Mary Kosh; Marjorie Patke and husband Edward; and Amy Koehler and husband C.C. A memorial service officiated by Pastor Phillip R. Clay will be held at 2:00 p.m. on Saturday, November 17, at First United Methodist Church in Wolfe City, Texas. Visitation will begin prior to the memorial service at 1:00 p.m. on Saturday, November 17. A graveside service will be held at 2:00 p.m. on Sunday, November 18, at Suggs Cemetery near Hearne, Texas. Honorary pallbearers are grandsons Eric Norcross, Brandon Fitzgerald, Brent Fitzgerald, Blake Fitzgerald, Nicholas Norcross, and Wesley Orr. Memorials may be made In Memory of Margaret Louise Kosh Norcross to the First United Methodist Church of Wolfe City, Texas, at P.O. Box 74, Wolfe City, TX 75496. Funeral arrangements are coordinated by R. W. Owens & Son Funeral Home, Wolfe City, TX, www.owensandsonfh.com.